PULASKI COUNTY, Mo. 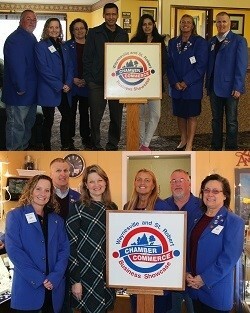 (March 1, 2019) — On Friday, the Chamber Surprise Patrol visited two Chamber member businesses to recognize them as the Chamber Business Showcase member for the month of March. The Business Showcase recipients are Fort Wood Inn and Laura’s Jewelry Design. The Surprise Patrol visited both businesses and dropped off a special sign to be displayed in their business throughout the month. The Fort Wood Inn opened in Waynesville in March of 2006. The Inn is 90-95% extended stay with 5-10% as overnight stays. Laura’s Jewelry Design opened in St. Robert in 2001 as a full service fine jewelry store including custom designing and offers the best jewelry repair on site, a wide range of inventory from Native American (Turquoise) to unique gold and diamond creations, and a large inventory of loose colored stones and diamonds.